Q5 is a Hard Rock/Heavy Metal band from Seattle, Washington that formed way back in the year 1983. They were the amalgamation of two Seattle bands; Jonathan K and Floyd Rose from THE C.O.R.E, and Rick Pierce, Evan Sheeley and Gary Thompson from TKO. They received critical acclaim for their debut album “Steel The Night” released in the year 1984, which earned them a spot on tours with TWISTED SISTER, LITA FORD and Y&T. Their second effort, "When The Mirror Cracks", was released in 1985 due to the success of their debut album by Polygram. They had an unfortunate demise due to internal personal differences that cropped up and the band soon folded. However, in the year 2014, Q5 were invited to perform at the Swedish Rock Festival and the band agreed to perform a "one-off" show. After that performance, the band returned stateside and realized that they still had the urge to play and record and promptly recruited drummer Jeffrey McCormack and guitarist Dennis Turner to their fold. 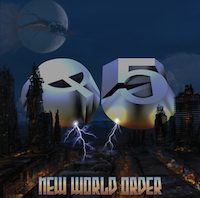 They have since signed to Frontiers Records and released their third album, "New World Order". "We Came Here To Rock", the first track of the album, reminds one of Bon Scott if he was still fronting for AC/DC at a ripe old age. A standard Rock anthem song with a totally forgettable guitar solo and antiquated backing vocals. This track is so stuck in the past, hell, it even has "rock" in its title! "One Night in Hellas" is the second track of the album. The vocals on this song seem jaded and out of tune in parts. It is however, ever so slightly, faster than the first track. The lead on this track seems right out of an IRON MAIDEN song. In fact the entire track seems to be influenced heavily by the NWOBHM giants. "The Right Way" is another example of a band ripping off AC/DC and making a mess of it all. The vocals are a blatant poor reproduction of the sound the Australian rockers pioneered. The only bright spot in this otherwise dull, drab track is the lead solo, which is controlled and hits the right spots. "A Prisoner Of Time", another Maiden-esque track, is another average song. It starts with a very simple riff, and for the next 7 minutes, it generates absolutely no excitement at all. The track seems completely unoriginal and entirely average. "Mach Opus 206" takes off with a chugging riff but loses steam almost as soon as it begins. A strange and amateurish track and clocking just over 5 minutes, one gets the impression that the track was added as a joke on the listener. It is an entirely pointless instrumental track and an exercise in futility. The musical theme that the band plays is mainly Hard Rock melodies infused with Heavy Metal sounds. Floyd Rose, one of the ex-founding members of the band, is a well-respected guitar innovator. He invented the "Floyd Rose Locking Tremolo System" that helps the guitar stay in tune in spite of repeated variation in pitch. The album in itself seems hackneyed and dated. There are definitely places where you can hear AC/DC or SAXON. The songs are run-of-the-mill NWOBHM and old fashioned. That is not to say that this album is not a great example of a Classic Rock n Roll album. The songs are adequate and are sure to be a hit with fans of that era. The vocals are just about good but one fears that there is nothing that really sets them apart from the giants of NWOBHM who walked the earth all those years ago. Having said that, there is no doubt on ones mind that they are not a bunch of talented musicians. Except they are terribly unoriginal and perhaps way past their sell-by date. This is strictly for die-hard fans of Q5 and fans of 80's Hard Rock music. Everybody else can give this a miss and not lose a wink of sleep.